"St George's Chapel" redirects here. For other uses, see St George's Chapel (disambiguation). St George's Chapel at Windsor Castle in England, is a chapel designed in the high-medieval Gothic style. It is both a Royal Peculiar, a church under the direct jurisdiction of the monarch, and the Chapel of the Order of the Garter. Seating approximately 800, it is located in the Lower Ward of the castle. St. George's castle chapel was established in the 14th century by King Edward III and began extensive enlargement in the late 15th century. It has been the location of many royal ceremonies, weddings and burials. Windsor Castle is a principal residence for Queen Elizabeth II. The day-to-day running of the Chapel is the responsibility of the Dean and Canons of Windsor who make up the religious College of St George, which is directed by a Chapter of the Dean and four Canons, assisted by a Clerk, Virger (traditional spelling of verger) and other staff. The Society of the Friends of St George's and Descendants of the Knights of the Garter, a registered charity, was established in 1931 to assist the College in maintaining the Chapel. 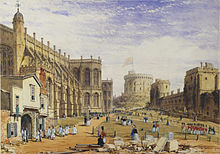 St George's Chapel (left) at Windsor Castle in 1848, showing the absence of the Queen's Beasts on the pinnacles (since replaced). In 1348, King Edward III founded two new religious colleges: St Stephen's at Westminster and St George's at Windsor. The new college at Windsor was attached to the Chapel of St Edward the Confessor which had been constructed by Henry III in the early thirteenth century. The chapel was then rededicated to the Blessed Virgin Mary, George the Martyr and Edward the Confessor, but soon after became known only by the dedication to St. George. Edward III also built the Aerary Porch in 1353–54. It was used as the entrance to the new college. The Quire of St George's Chapel, by Charles Wild, from W.H. Pyne's Royal Residences, 1818. St George's Chapel became the Mother Church of the Order of the Garter, and a special service is still held in the chapel every June and is attended by the members of the order. Their heraldic banners hang above the upper stalls of the choir where they have a seat for life. 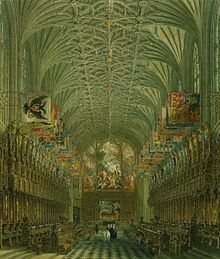 The period 1475–1528 saw a radical redevelopment of St George's Chapel under the designs of King Henry VII's most prized counsellor Sir Reginald Bray (later Chancellor of the Duchy of Lancaster), set in motion by Edward IV and continued by Henry VII and Henry VIII. The thirteenth-century Chapel of Edward the Confessor was expanded into a huge new Cathedral-like chapel under the supervision of Richard Beauchamp, Bishop of Salisbury, and the direction of the master mason Henry Janyns. The Horseshoe Cloister was constructed for the new community of 45 junior members: 16 vicars, a deacon gospeller, 13 lay clerks, 2 clerks epistoler and 13 choristers. The choristers of St George's Chapel are still in existence to this day, although the total number is not fixed and is nearer to 20. The choristers are educated at St George's School, Windsor Castle. They are full boarders at the school. In term time they attend practice in the castle every morning and sing Matins and Eucharist on Sundays and sing Evensong throughout the entire week, with the exception of Wednesdays. St George's Chapel was a popular destination for pilgrims during the late medieval period. The chapel was purported to contain several important relics: the bodies of John Schorne and Henry VI and a fragment of the True Cross held in a reliquary called the Cross of Gneth. It was taken from the Welsh by Edward II after his conquest along with other sacred relics. These relics all appear to have been displayed at the east end of the south choir aisle. The Chapel suffered a great deal of destruction during the English Civil War. Parliamentary forces broke into and plundered the chapel and treasury on 23 October 1642. Further pillaging occurred in 1643 when the fifteenth-century chapter house was destroyed, lead was stripped off the chapel roofs, and elements of Henry VIII's unfinished funeral monument were stolen. Following his execution in 1649, Charles I was buried in a small vault in the centre of the choir at St George's Chapel which also contained the coffins of Henry VIII and Jane Seymour. A programme of repair was undertaken at St George's Chapel following the Restoration of the monarchy. The reign of Queen Victoria saw further changes made to the architecture of the chapel. The east end of the choir was reworked in devotion to Prince Albert; the Lady Chapel, which had been abandoned by Henry VII, was completed; a royal mausoleum was completed underneath the Lady Chapel; and a set of steps were built at the west end of the chapel to create a ceremonial entrance to the building. In the 21st century, St George's accommodates approximately 800 persons for services and events. On the roof of the chapel, standing on the pinnacles, and also on pinnacles on the sides, are seventy-six heraldic statues representing the Queen's Beasts, showing the Royal supporters of England. They represent fourteen of the heraldic animals: the lion of England, the red dragon of Wales, the panther of Jane Seymour, the falcon of York, the black bull of Clarence, the yale of Beaufort, the white lion of Mortimer, the greyhound of Richmond, the white hart of Richard II, the collared silver antelope of Bohun, the black dragon of Ulster, the white swan of Hereford, the unicorn of Edward III and the golden hind of Kent. The original beasts dated from the sixteenth century, but were removed in 1682 on the advice of Sir Christopher Wren. Wren had condemned the Reigate stone, the calcareous sandstone of which they were constructed. The present statues date from 1925, when the chapel was restored. Members of the Order of the Garter meet at Windsor Castle every June for the annual Garter Service. After lunch in the State Apartments in the Upper Ward of the Castle they process on foot, wearing their robes and insignia, down to St George's Chapel where the service is held. If any new members have been admitted to the Order they are installed at the service. After the service, the members of the order return to the Upper Ward by carriage or car. The Order formerly had frequent services at the chapel, but, after becoming infrequent in the 18th century, they were discontinued in 1805. The ceremony was revived in 1948 by King George VI for the 600th anniversary of the founding of the Order, and has since become an annual event. After their installation, members are each assigned a stall in the chapel choir above which his or her heraldic devices are displayed. A member's sword is placed below a helm which is decorated with a mantling and topped by a crest, coronet or crown. Above this, a member's heraldic banner is flown emblazoned with his or her arms. A Garter stall plate, a small elaborately enamelled plate of brass, is affixed to the back of the stall displaying its member's name and arms with other inscriptions. On a member's death, the sword, helm, mantling, crest, coronet or crown, and banner are removed. A ceremony marking the death of the late member must be held before the stall can be assigned to anyone else. This ceremony takes place in the chapel, during which the Military Knights of Windsor carry the banner of the deceased member and offer it to the Dean of Windsor, who places it on the altar. The stall plates, however, are not removed; rather, they remain permanently affixed somewhere about the stall, so the stalls of the chapel are festooned with a colourful record of the members throughout history. Fan vaulting of the Choir of St George's Chapel, with the Garter banners on either side below. St George's Windsor is among the most important and ambitious medieval chantry foundations to have survived in England. The college, itself a medieval chantry, also contains a number of independent chantries in the form of altars and small chapels dedicated to various members of the English monarchy and also to a number of prominent courtiers, deans and canons. Masses, the Office and prayers would be offered in these chantries for the good of the founder. Henry VIII had intended a chantry to be set up in the chapel, despite the fact that he instituted the religious changes which brought about the Reformation in England and the eventual suppression of chantries. The much-admired iron gates in the sanctuary of the chapel as well as the locks on the doors of the chapel are the work of the medieval Cornish metalsmith John Tresilian. The status of the college as a royal foundation saved it from dissolution at the Reformation. As a result, many of the smaller chantries within the chapel were preserved. These are the only remaining chantries of their kind in England which have never formally been suppressed. "Wythin thys Chappell lyethe beryed Anne Duchess of Exetur suster unto the noble kyng Edward the forte. And also the body of syr Thomas Sellynger knyght her husband which hathe funde within thys College a Chauntre with too prestys sy’gyng for ev’more. On whose soule god have mercy. The wych Anne duchess dyed in the yere of oure lorde M Thowsande CCCCl xxv"
The chantry received its current name in honour of the earls of Rutland, descendants of Anne and Sir Thomas; their daughter, also named Anne, married George Manners, 11th Baron de Ros and gave birth to Thomas Manners, 1st Earl of Rutland. The tomb of George and Anne Manners is a prominent feature of the chantry; their effigies are carved in English alabaster. Stillborn son of Queen Anne (last monarch of the House of Stuart), in 1698. Stillborn son of Princess Charlotte in 1817. George VI, King of the United Kingdom, died 1952. Interred 26 March 1969 following its construction. 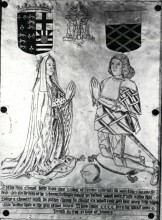 William, 1st Baron Hastings (1431–1483), a nobleman and close friend of King Edward IV; in the north aisle of St George's Chapel, next to Edward IV. Henry Somerset, 1st Duke of Beaufort (1629–1700) and his ancestors in the private Beaufort Chapel; the original monument by Grinling Gibbons was moved to St Michael and All Angels Church, Badminton, in 1878. Wenceslaus Hollar. View and Ground Plan of St. George's Chapel, Windsor ca. 1671. John Henry Le Keux. St. George's Chapel, Windsor. Ground Plan 1810. Engraved after a plan by F. Mackenzie, published in Britton's Architectural antiquities of Great Britain, 1807. Copper-engraved antique plan. Francis Eginton, artist, painted the arms of the knights of the Garter for two Gothic windows in the stalls. ^ a b "Harry and Meghan to wed at Windsor in May". BBC News. 28 November 2017. Retrieved 28 November 2017. ^ "Windsor Royal Beasts on St George's Chapel roof". Wordpress. Retrieved 10 October 2014. ^ London, H. Stanford (1953). “The” Queen's Beasts: An Account with New Drawings of the Heraldic Animals Witch Stood at the Entrance to Westminster Abbey on the Occasion of the Coronation of Her Majesty Queen Elisabeth II., 2. June 1953. Newman Neame. p. 15. ^ "Sir Frederick Minter". The Times. 15 July 1976. p. 19. ^ Blackburne, Harry W. (2008). The Romance of St. George's Chapel, Windsor Castle. Wildside Press. pp. 14–. ISBN 978-1-4344-7428-5. ^ a b Eleanor Cracknell (15 July 2011). "The Rutland Chantry". College of St George. Retrieved 19 May 2018. ^ Yeginsu, Ceylan (2 March 2018). "Prince Harry and Meghan Markle Invite Members of Public to Wedding Day". The New York Times. ISSN 0362-4331. Retrieved 5 March 2018. ^ "Royal Burials in the Chapel since 1805". College of St George. 2017. Retrieved 19 May 2018. ^ "Royal Burials in the Chapel by location". College of St George. 2017. Retrieved 19 May 2018. ^ "The Roos Monument in the Rutland Chantry Chapel". College of St George. 10 September 2010. ^ "View and Ground Plan of St. George's Chapel, Windsor - Wenceslaus Hollar". 21 June 2016. ^ "View and Ground Plan of St. George's Chapel, Windsor - Wenceslaus Hollar". 8 May 2015. ^ "Free stock images for genealogy and ancestry researchers". www.ancestryimages.com. Begent, Peter J.; Chesshyre, Hubert; Chesshyre, D. H. B.; Jefferson, Lisa (1999). The most noble Order of the Garter: 650 years. Spink. Keen, Laurence; Scarff, Eileen, eds. (2002). Windsor: medieval archaeology, art and architecture of the Thames Valley. British Archaeological Association. Saul, Nigel, ed. (2005). St George's Chapel, Windsor, in the Fourteenth Century. Boydell Press. ISBN 978-1-84383-117-4. Richmond, Colin; Scarff, Eileen, eds. (2001). St Georges Chapel, Windsor, in the late Middle Ages. Windsor: Maney Publishing. ISBN 978-0-9539676-1-2. Wikimedia Commons has media related to St. George’s Chapel, Windsor Castle. This page was last edited on 8 February 2019, at 21:58 (UTC).